You can search the world over and if you find one true and good friend, you have found a treasure! I'm beyond blessed to have a handful of amazing women in my life that I can call a genuine friend! Not surprising, is that most of these women I've met through my Stamping adventures!! 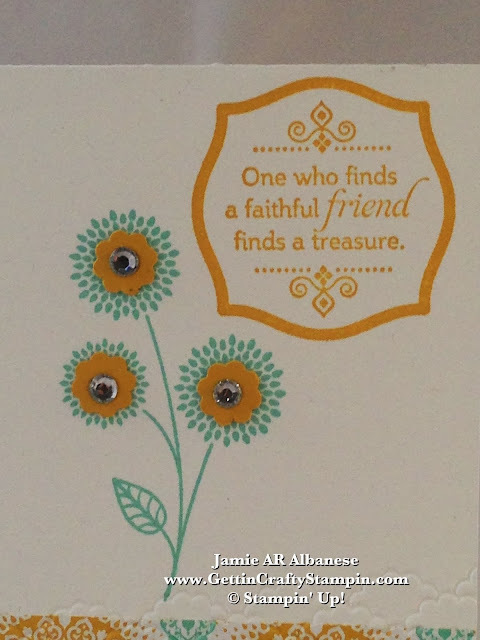 Go ahead, send a hand-stamped card to that special friend or two and show them that you care! 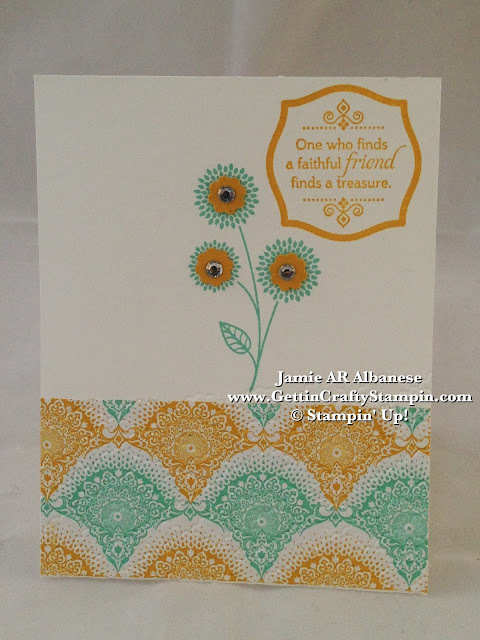 Create this sweet card with a Stamped Flower in Costal Cabana ink. It mimics the eastern flair of the Eastern Elegance Designer Series Paper for a fun and trendy look. 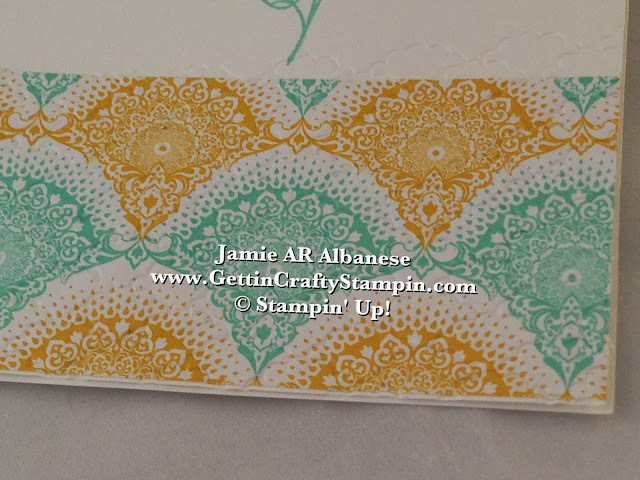 Coordinating the sentiment to the Eastern Elegance paper with coordinating inks, this friendship stamp in Crushed Curry ties into this punched Itty Bitty Flower in Crushed Curry card stock. This adhesive backed Rhinestone Jewel makes for the perfect center to this special card, for a special person! Embossing this Fancy Fan texture that mimics the Eastern Elegance pattern. It's subtle but oh so cute and a fun element showing you care enough to send only the best... for a Best Friend and Treasure in your life!! Our Big Shot makes it sooo easy to WOW with any project. I care and am grateful for you coming by today! I try to post daily and hope to see you back, often. Bring your friends and family back to play along!! Join me in my many upcoming classes, too!! May your adventures in life be with a friend or two (or more). Finding those special people who get you and love you, anyway (lol), ought to be treasured! Send them a hand-stamped card and show them how precious they are to you!! Hugs to those special people in my life... you know who you are!